One of my big changes with moving to a new house is I do not have a garbage disposal anymore. I constantly have to put scraps in little plastic containers next to the sink to empty out the receptacles in the drain. This attracts bugs and odors that I sure don’t need. I was browsing Buy Green online and found this stylish Stainless Steel Composter with charcoal filter to set next to my sink instead! Oh what a difference. It holds a gallon so if I get super lazy I can keep filling it up for awhile without emptying it. Or I can continue to empty it and cut down on the odors which are greatly improved with the charcoal filter. It looks so much nicer on my counter than an open plastic container of scraps and so much healthier as well. I am going to be starting a composting bin outside with worms in the near future so now I can take my stainless steel bucket outside to my composter and feed my worms all of the yummy goodness and they in return will give me great organic dirt for my gardens and trees! What a way to be friendly to the earth! Specification - 6.75 inches diameter and 8.5 inches tall. This crock holds one gallon. Buy Green has Green products for your entire home! A definite one stop shopping for buying green and one of my favorite companies! They are detail oriented and bring you only the best of the Green products available today. 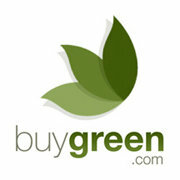 Thanks to Buy Green for sponsoring the Honor the Earth Giveaway Hop! 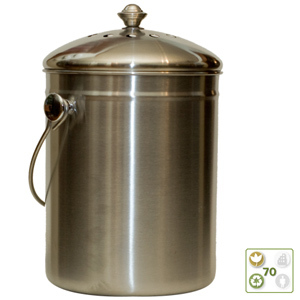 They have donated a Stainless Steel Composter like the one I reviewed. Stay tuned for the Giveaway beginning April 12th. In the waiting be sure to visit BuyGreen.com and check out all of their Earth Friendly products. I received a product from buy green in exchange for an honest review. I would love to get a kitchen composter and I love the way this one looks! I love all the products that buy green has to offer! Thanks for turning me on to Buy Green. Right now I am using an old butter bowl.